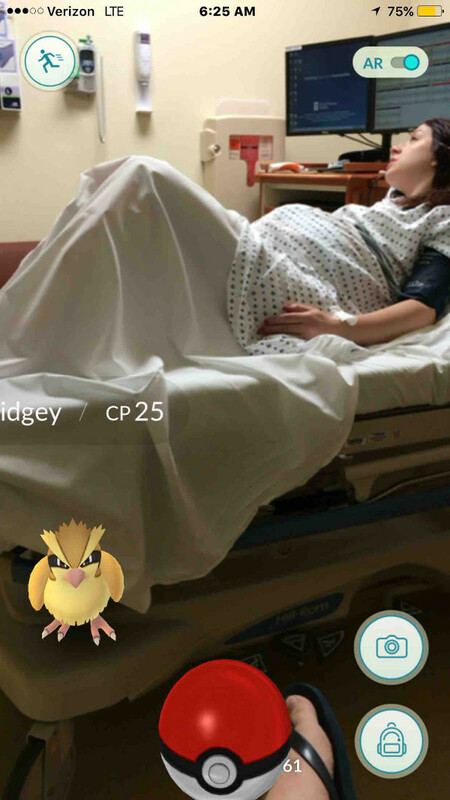 Technology has done some great things to improve the birth experience, but somehow we doubt that includes putting Pokemon Go into the birth plan. Clearly, someone forgot to tell this dad. While waiting for his wife Jessica to have a c-section, Jonathan Theriot passed the time playing the new Pokemon Go game on his mobile. The game compels players to travel between a real and virtual world catching Pokemon, by using a phones camera and GPS to superimpose characters around you. And it was a yellow bird-like Pokemon called Pidgey that decided to join Jonathan and Jessica in the delivery room ahead of their third child’s arrival. Jonathan took a screen shot of the Pidgey perched on Jessica’s hospital bed and posted it to Imgur, where it quickly went viral. While we will lock this in as an activity husbands best refrain from when their wives are about to give birth, Jonathan tells BuzzFeed Jessica “wasn’t mad at all”. “She just kind of laughed at it,” he says. We are happy to report this battle had a happy ending: the Pidgey was caught thanks to Jonathan’s dedicated virtual skills and the couple’s daughter, Ireland Sage Theriot, arrived safely thanks to Jessica being a real-world rock star. Jonathan is not the only husband to risk being reprimanded in the delivery room, another dad-to-be took a selfie while his wife was in the throes of labour. And, in case you are wondering what else dad’s shouldn’t do while their wives are in labour, we’ve compiled a list.